OmniUpdate, the leading web content management system (CMS) and digital marketing solutions provider for higher education, released OU Insights™ for its OU Campus™ CMS. The new module fully integrates with the CMS and regularly monitors a website’s health for adherence to standards and regulations related to search engine optimization (SEO), accessibility, links, and spelling. OU Insights continually performs a thorough analysis of a website and reports broken links and misspellings, as well as ADA accessibility and SEO problems. The tool sends an email to select CMS administrators with an overall site score, along with a link to a detailed report showing recommended actions to take next. Because of its integration with OU Campus, OU Insights provides CMS administrators and users the ability to fix problems with a single click directly from the report. 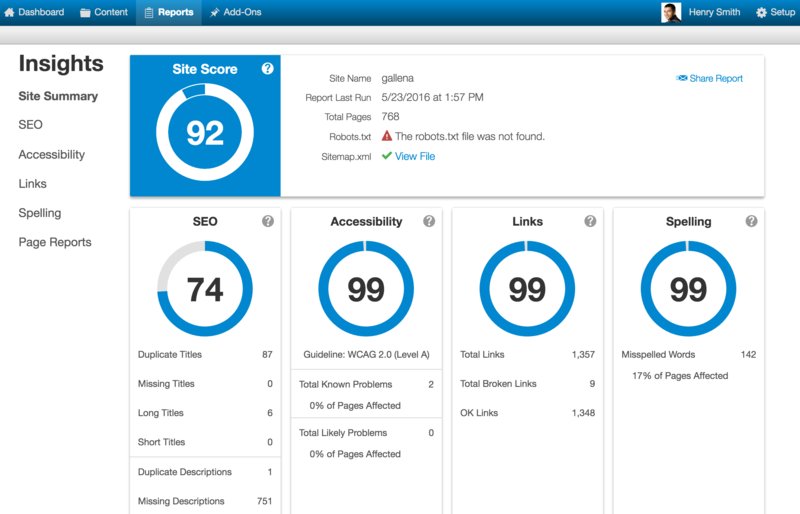 OU Insights includes both site-wide and page-specific reporting. Site-wide reports give a comprehensive assessment while page-level reports highlight page-specific areas of concern from the four core areas, as well as details such as version, version comments, publisher, last published, approver, and more. OU Insights can be configured to run as often as daily and scan as many pages as desired on the production server, even those not managed in OU Campus, providing CMS administrators with a comprehensive overview of their website. OU Insights also keeps a score history, allowing administrators to compare scores over time at the site level. OmniUpdate is the leading provider of content management solutions designed to streamline content administration and solve the digital marketing and communication challenges of higher education. Its user-friendly platform and award-winning technology and support empower customers to be engaged and personalized in their communications, cost-effective and efficient in their channel management, and scalable and extensible in their development. For more information, visit http://omniupdate.com.